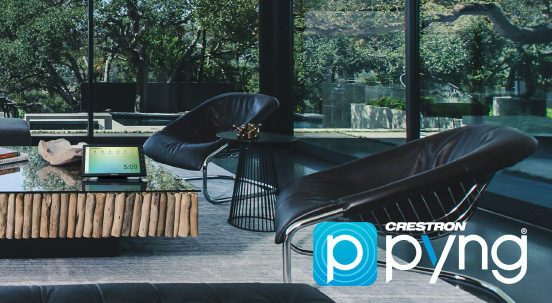 Crestron Pyng® technology enables set up and control of luxury home automation in just a few steps right from the iPad®. Technology integrators can rapidly create lifestyle scenes for each room, schedule events, and much more without ever opening a laptop. It also empowers homeowners to confidently make changes to their scenes, settings, and even system schedules with just a few taps on an iPad or touch screen. Crestron Pyng technology supports hundreds of our world class products, making it fast and easy to deliver luxury home automation on any scale. It delivers a truly spectacular homeowner experience with GUIs that include intuitive dropdown and slide-out windows, and scrolling lists on all devices. Pyng technology supports the best in class Crestron technology found in the world’s most prestigious homes. Select any of a wide array of wired and wireless dimmers, switches, keypads, shade motors, thermostats, sensors; streaming radio services, multi-room audio, centralized lighting control, ONVIF cameras, door locks, security systems, ceiling fans, touch screens, and more. Pair devices together in minutes and start customizing scenes and settings, Pyng technology makes it easy. 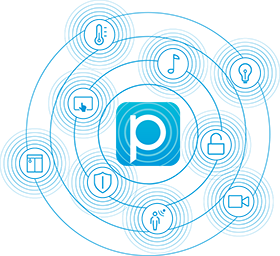 Pyng technology was developed in conjunction with the Home Elements toolkit to allow dealers to deliver the performance, scalability, and reliability of Crestron home automation without having to learn to use any new software. How do they work together? Simply start with Pyng, then drag Pyng controls into Home Elements and keep going to add DigitalMedia™ video distribution with custom controls. Crestron Pyng technology ensures a spectacular user experience with GUIs that include dynamic dropdown and slide-out windows, and scrolling lists on all devices. Convenient source-sharing allows homeowners to share music throughout the home all from a single window without navigating among multiple pages. With just a few taps homeowners can browse a library of over 20 beautiful backgrounds and update every touch screen in the home. Simply add a Pyng Hub to any Crestron system to speed up configuration and empower homeowners to personalize their settings at any time. The hub connects Pyng supported devices and continuously backs up all home settings to the cloud – so making changes is easy and secure. Adding a new iPhone® or iPad is effortless. Simply open the app while connected to the home Wi-Fi® network and the controls appear instantly in any of the seventeen languages supported. I was able to pair and test over 50 Crestron devices in about an hour. That includes programming all the keypads, creating multiple scenes, and scheduling events. My experience with Pyng technology has been excellent. Once the initial set up is complete, anyone can easily modify settings or create new scenes right from the app. Homeowners can make changes themselves with the confidence that all their original settings are backed up in the cloud. Eliminate continual requests to modify lighting scenes, change daily scheduled events, or change button names – let the homeowner make those modification whenever they are so-inclined. Dual password protection means one password for your initial setup and one set of customizable controls for your client. Put the unlimited power of the cloud to work for your business, subscribe to the MyCrestron Residential Monitoring Servicetoday.